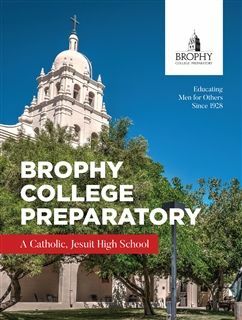 Brophy College Preparatory is a Catholic, Jesuit school which serves young men in 6th-12th grades. and to developing Men for Others to serve the world. In April 1927, Mrs. William Henry Brophy gave the California Province of the Society of Jesus (now Jesuits West) a gift of 29.9 acres that was, at that time, outside the Phoenix city limits. The gift also included $250,000 that was to fund the establishment of a school named after her late husband. On Jan. 18, 1928, the Wasielewski Company broke ground and on April 29, 1928, the cornerstone was laid with much celebration. On Sept. 10, 1928, the doors opened with an enrollment of 68 young men. Today, Brophy has an enrollment of approximately 1400 students and over 14,000 alumni who live and serve Ad Majorem Dei Gloriam – AMDG (for the greater glory of God) – all over the country and the world. ﻿Brophy College Preparatory, the only Catholic, Jesuit high school in Arizona, strives to educate the whole person through rigorous academics and innovative technology, through outreach and service, and through retreats and personal reflection. Inspired by St. Ignatius of Loyola, a Jesuit education is focused on having students graduate as young people who are open to growth, intellectually competent, religious, loving and committed to doing justice. What does it mean to be Jesuit educated? A Jesuit education combines the pursuit of knowledge with a dedication to faith in God and love of mankind, and a commitment to social justice and to serving others. To be Jesuit educated is to embrace the concept of magis - to always strive to serve more, learn more and to love more deeply. Pope Francis, a Jesuit, exhorts us to move out of our comfort zones and toward the frontiers of an interconnected world full of great need. "Today our prime educational objective must be to form men-and-women-for-others; men and women who will live not for themselves but for God and his Christ – for the God-man who lived and died for all the world; men and women who cannot even conceive of love of God which does not include love for the least of their neighbors; men and women completely convinced that love of God which does not issue in justice for others is a farce." ~ Pedro Arrupe, S.J. JV 4:30 p.m.; Varsity 5:30 p.m.
For the full athletics calendar, go to the Calendar at the top of the homepage. Thank you for supporting Brophy's Jesuit mission to educate Men for Others.